Claudine Norden, right, got some help pumping up the crowd. As a blanket of snow turned Summit County white overnight, the Frisco Nordic Center featured a different color on Saturday morning. Pink was everywhere and in every shade as participants in the 12th annual Tubbs Romp to Stomp Out Breast Cancer gathered in their snowshoes for the 3k race and 3k/5k walk. The event is a fundraiser for Susan G. Komen for the Cure, a wide-reaching organization that supports breast cancer research. Colorado is one of four states to host the event. 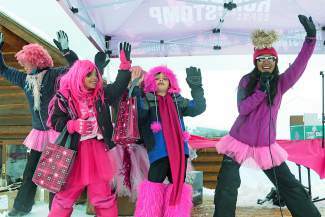 During its 12 years in Summit County, the event has raised more than $1 million for the Susan G. Komen. Participant numbers this year surpassed last year’s, with more than 1,900 people signed up, including 100 children for the Li’l Romper Dash. Music pumped through the speakers at the starting line and participants danced to stay warm as they waited for the go-ahead. Despite the thick cloud of snowflakes, smiles abounded with a cheerful and festive atmosphere. “We’re super excited,” said Isabel Rawson, whose group, the Rocky Mountain Knocker Stompers, entered for its first years, rocking hot pink mohawk hats. Other hats glimpsed included pink cowboy hats, pink bunny ears and giant pink fluffy wigs. “It’s wild, crazy and wonderful,” said John Sutor, who was visiting from Connecticut. It was the first time at the event for his daughter Julie, a resident of Frisco. This was the third year for Amy DeFroi of Longmont, who is a cancer nurse at the Rocky Mountain Cancer Center. She stood out in the crowd with a Viking hat and leopard-print top, and was attending with a former patient and her family. Among the locals and Front Rangers in the crowd were a few from a little bit further away. Katie McCullough is an 11-year breast cancer survivor and hails from New Zealand. “I was here last year and saw it advertised last year and I thought, ‘Oh I’m going to be here at the same time this year, I’ll do it,’” she said with a laugh. She also works for a breast cancer support group in her hometown, although her part of New Zealand has beaches rather than snow, so it was her first time snowshoeing for the cause.